Friday! Friday! Happy Friday! And, um, wow. Happy February! Recently, Jamie and I hit up the Pottery Barn Outlet and I posted my haul here on the blog. I bought a mix of things for the house and clothes for me. I did really well with clothes and promised an update with how I wore them. Update is today! I will start with the caveat and apology that I am *horrible* at taking pictures of myself and obviously need a larger mirror for this task (the one I use is in Little's room and is pretty narrow). I have been searching for a gingham shirt for awhile and could not find one that I loved. As soon as I walked into the j.crew outlet, I spied this one, tried it on and was sold. It fits perfectly and can be dressed up (like in this outfit) or dressed down. 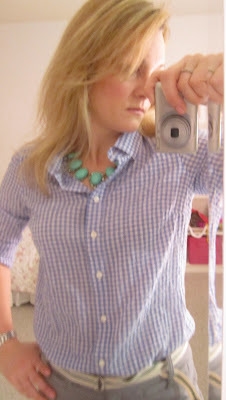 I paired it with the turquoise bauble necklace from j.crew, a pair of light grey trousers and a belt I have had for years. I love this cardigan. My one regret from this shopping excursion was not buying more of them! I paired it with a cream shell (purchased from Banana Republic Outlet last year), dark grey pants and a long necklace that I bought at the j.crew outlet last year. 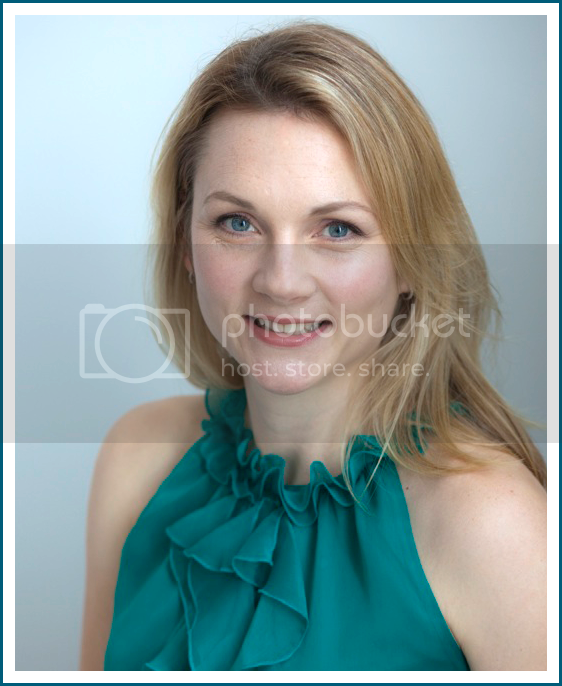 I'm not sure this is the most flattering picture, but here you go. 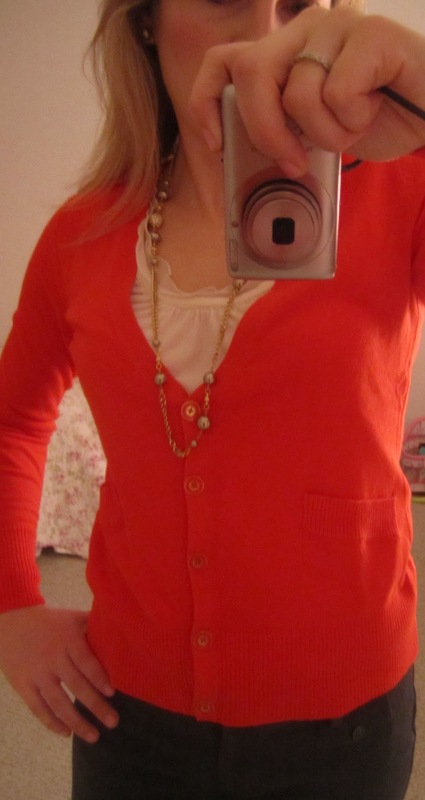 I thought this color combination of pink and coral was so happy and springy. I embraced femininity and wore this outfit with pearls and soft pink slingbacks. 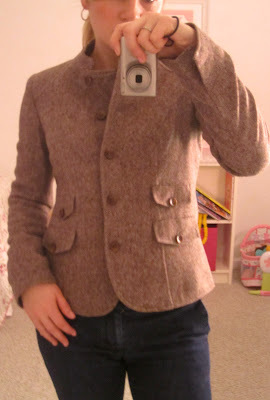 I wore my tweed jacket (a steal at $50) on a casual Friday in the office. I wore it with a long sleeve cotton tee under it (it's a bit itchy), a pair of bootcut jeans (Long and Lean from Gap) and leopard print flats. I wore my hair back and threw on some hoop earrings. Done! There you go! Four outfits from my big outlet haul. Oh ... I want to go back and get more. Happy weekend all! Any great plans? Anyone heading to the outlets? If so I wish you godspeed and great deals.